Free agency. It represents a world of endless possibilities. Especially at a time where generational superstars like Bryce Harper and Manny Machado are out there, openly available to all 30 teams, the free agent market offers a chance for fans to dream big. Of course, any Twins faithful who fantasized of flashy acquisitions this offseason have found themselves mostly disappointed. Minnesota's avoidance of the traditional free agency avenue has been resolute, almost as if by design. I believe there are reasons behind this approach that don't amount to, "They're cheap". * In their first signature move, they quickly signed free agent Jason Castro to a three-year contract. He was solid in his first year, and the second was a total loss. Now he enters Year 3 as a fairly significant (and somewhat pricey) question mark. * In their second year, they signed Addison Reed, Logan Morrison and Lance Lynn for a combined ~$25 million. Morrison and Lynn were busts, and so to a lesser extent was Reed, who now enters Year 2 as a fairly significant (and somewhat pricey) question mark. * They made a serious bid for Yu Darvish last winter, reportedly offering more than $100 million before falling short of the Cubs and watching the right-hander immediately bomb in Chicago. * They inherited the contract of Ervin Santana, who qualifies as one of Minnesota's most successful free agent signings ever, but saw the downside of that deal as well with $13.5 million of their payroll dedicated to a guy who provided basically nothing in 2018. * They also inherited the contract of Phil Hughes, some of which they're still on the hook for this year. Granted, it was an ill-advised extension rather than Hughes' original deal that went sour, but he's another fine example of the dangers in long-term commitments to veterans – even those that are on top of their games at the time. So now we come to the team's approach this year in free agency. With the exception of Nelson Cruz, none of the players acquired by Minnesota were on those lists fans skimmed through in September and let their brains run wild, because none of them were firmly expected to be on the market. And now most players that did occupy the upper levels of those rankings are gone. Is this by design? Are the Twins attempting to take advantage of a league-wide aversion to spending by capturing quality players who are being unfairly devalued? It sure seems that way. Instead of tethering themselves to expensive, inescapable commitments for players on the higher tiers (which, as we've learned time and time again, carry no assurances) the front office is making deals on its own terms. Martin Perez on a one-year deal plus team option is actually a lot more interesting than those standard Terry Ryan flyers of yesteryear, because it has real upside. Perez doesn't turn 28 until April. If the Twins are able to unlock whatever they see in him (and I have to believe it's more than meets the eye, because other teams were interested too), they've actually found themselves an asset. The same is true of Cruz and Blake Parker, though they don't have the same long-term fit potential. One that does is Jonathan Schoop. He's probably the player we're not talking about enough. The Twins aggressively signed him one week after his non-tender from Milwaukee. He's an athletic defender, one year removed from an All-Star season, and he's averaged 25 homers in the past three seasons. Most vitally, he's only 27. Guys like this don't become available too often. And for teams that want more of a sure thing – such as the Brewers, who elected to move on – maybe he's not the best choice. But within Minnesota's developing strategy, he made all the sense in the world. Unlike the others added this winter, his contract doesn't include a 2020 option, but if he rebounds, blends into the nucleus, and likes it here? Now you might've found yourself a newly minted piece to your core. It's tough to knock any of these deals on their own. But when you look at the big picture it's easy to feel a bit underwhelmed. As someone in the forums astutely put it: "the sum is lesser than its parts." I understand and empathize with the lack of enthusiasm some are feeling. But ultimately, it's not Jed Lowrie or Adam Ottavino that's going to put fans in the seats. Winning will. You may not be jazzed about the caliber of these names. But don't conflate the current front office with the previous regime. These aren't your garden-variety bargain bin signings of the Kevin Correia or Mike Pelfrey ilk. There's a deeper methodology in place, and I'm sure I'm only scratching its surface. From my view, the Twins are hoping they can hit on a few of these gambles while the incumbents rebound enough to keep them hanging in a weak division. Then, around the middle of the season they can more clearly assess their position and their needs. As I concluded on Monday, the silver lining to this resource preservation is that it will give them extreme flexibility leading up to the trade deadline. The pessimistic view is that the Twins are treading water until 2020. The optimistic (and I think more realistic) view is that they're treading water until June or July. Let us not forget: The most impactful, game-changing transaction in the American League over the past two years didn't happen during the offseason. It happened when Detroit traded Justin Verlander to Houston in August of 2017. Given the league's expected landscape this summer, it's not hard to envision similar opportunities emerging in a sea of non-contenders. So, there's something to dream on. "The pessimistic view is that the Twins are treading water until 2020. The optimistic (and I think more realistic) view is that they're treading water until June or July." I am really in a back and forth battle with myself over the teams strategy.Do they believe so strongly in the young guys coming up that they only want 1 year deals?Why can't they pay a little more and grab some guys with potential greater upside, does everything have to be from the bargain bin?Why can't they just invest in slightly more expensive talent bringing them up to league average payroll is that, should that, really be an issue at this point? Why can't we at least try to go long term with at least one player this year? If they spent to their max even if some of that talent doesn't pan out at least theytried and if it does pan out then maybe we have a team that can compete this year.Just when I think their strategy is to find out about the young players we have on the farm they go and grab marginal players that will likely block them from pitching in until the second half of the season. Honestly I don't know what they are trying to do in 2019 anymore.If we are punting on 2019 then at least lets find out what we have on the farm as best we can so we know what holes need filling next year.If we aren't punting this is a bit of a strange strategy (grabing all marginal bounce back players)to me. I mean I guess they've got me no matter what.I am going to watch and or follow them whether they are a train wreck or average or successful.I just have too much invested in this team not to watch, but right now I am feeling a bit disappointed in where things are at.There is always 2020 and I am excited about the young guys we have in MILB and they way the draft is shaping up but I was hoping they were going to do a little more in 2019 for MLB club. It's funny that you bring up Correia - Perez is actually very comparable to him with the low K/9 and high WHIP - so I think Perez's signing is incredibly similar to the Pelfrey/Correia signings, especially with news that the Twins plan to use him in the rotation. It's great that he's 'only' 28 years old, but he's been a bad starter for several years now. At least Correia had a better BB/9 as a Twin! On the flip side, I do think the Schoop signing has a lot of upside and most everyone is too concerned that it's a one year deal. He's only a year removed from a 5.2 WAR season, and a repeat of something close to that would give this squad a major boost. We need more moves like this and less like Perez. Martin Perez on a one-year deal plus team option is actually a lot more interesting than those standard Terry Ryan flyers of yesteryear, because it has real upside. Perez doesn't turn 28 until April. FWIW, Ryan signed Hughes at age 28 too. Pelfrey was only 29. Correia was a 32-year-old signed to a two-year deal with the sole purpose of eating innings, regardless of quality. There is no reason to expect the same kind of inflexibility with Perez. We're all obviously aware of his terrible past numbers but the Twins saw something here and clearly they aren't the only ones (otherwise he wouldn't have gotten an MLB deal, much less a somewhat shocking $3.5M guaranteed). One thing I don't really question about this front office is their ability to pull the plug on something that's not working. They don't get overly invested in their decisions. In fact, I think that's pretty much the story of this offseason. They're not forcing themselves to get too invested in anyone. They're trying to strike hidden values and sneaky adds. I don't blame you for skepticism but let's be honest, they got burnt whenever they went the opposite route last offseason, and in fact their best moves turned out to be those low-key sleepers (trading for Cave, signing Anibal, trading for Odorizzi). So I'm cautiously giving them the benefit of the doubt and trusting their judgement for now. That'll change if the majority of these moves fizzle and end up holding back a solid team. 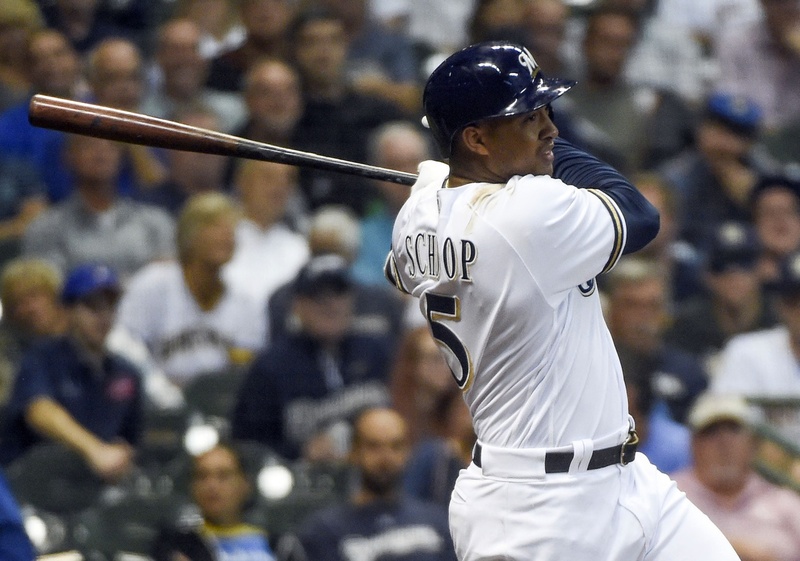 1.Most of us question the value of players who've been DFAed.Signing Schoop might be a good under the radar signing for the longer term, but Cron and Parker have had journeymen careers and are crap shoots going forward.A FO building to win now would go for Paul Goldschmidt.Our minor leagues are reinforced.Use these pieces to get a guy like Goldschmidt from a Dback team rebuilding.Not like we have any other 1B in the organization with all star potential. 2. The Perez signing is another crap shoot.This guy has shown nothing in his major league career and the fact that a Texas team woefully undermanned in their rotation DFAed him is pretty telling.Does Levine know something that no one else in the Ranger organization does? 3. As you, yourself, have noted, there was no excuse for a hungry and far-sighted organization to spend the dollars on David Robertson(or Craig Kimbrel) to fill a glaring closer hole.As many on this board noted, there is nothing more disheartening to a young team than to blow late inning leads.What good is it if they finally settle on a Reed or May or Romero in that role by July, when lack of said closer in April and May leads to bowing out of contention by the trade deadline?This is the lack of resolve that has infuriated the TD community.Sign Kimbrel and all will be forgiven.But does anyone think that will happen with this organization? 4.And finally, in their third hot stove offseason, this dynamic duo has completed one low level trade - Odorizzi!No, I don't count dumping veterans in July when the team is out of it.Again, if this FO was really all in to contend in 2019 they should leave no stone unturned to find at least one starter to slot ahead of a still evolving Berrios.Without a clear #1 or 2 starter, their chances to get past a first round playoff series is slim and none.Why couldn't they be proactive, package one of their stalled prospects(Sano is my choice), a top 10 prospect, and some filler to land a true ace, e.g., Thor Wheeler from the Mets, Greinke or Baumgartner.On MLB.com, one of the writers suggested a Buxton for Jon Gray trade. Very risky but when your farm system is not producing pitching, these risks must be taken in a winning organization. Instead, it is pretty clear Falvine is going to sink or swim on Sano/Buxton's 2019 performance.Oh yes, signing Josh Davidson after Sano was traded might not have been a bad Plan B. Hope I'm wrong here and we see a big rebound in 2019 but this has been such a very uninspiring offseason that I find it difficult to envision this happening unless just about everything breaks right.Do I blame the new FO for this?Not entirely.Pohlad the banker got just what he wanted - a pair that are not risk takers and who buy into the Twins way that investing money for a top free agent is not a valid approach. Tweaking the edges is good enough when all ownership wants is to make money year after year rather than invest big one or two yearsto produce bigger rewards in the future.Who needs Machado or Harper or Kimbrel when we can still make a profit with mediocrity. I really think this fanbase needs to consider an ownership revolt. We all helped finance this beautiful ballpark I can't afford to take my family to and we STILL get the Bankster boogie... I will not support this team anymore (after 52 years) until ownership does. They seemed pretty invested in Logan Morrison last year, well after it was quite obvious he didn't have it. 1. Most of us question the value of players who've been DFAed. Signing Schoop might be a good under the radar signing for the longer term, but Cron and Parker have had journeymen careers and are crap shoots going forward. A FO building to win now would go for Paul Goldschmidt. Our minor leagues are reinforced. Use these pieces to get a guy like Goldschmidt from a Dback team rebuilding. Not like we have any other 1B in the organization with all star potential. 2. The Perez signing is another crap shoot. This guy has shown nothing in his major league career and the fact that a Texas team woefully undermanned in their rotation DFAed him is pretty telling. Does Levine know something that no one else in the Ranger organization does? 3. As you, yourself, have noted, there was no excuse for a hungry and far-sighted organization to spend the dollars on David Robertson(or Craig Kimbrel) to fill a glaring closer hole. As many on this board noted, there is nothing more disheartening to a young team than to blow late inning leads. What good is it if they finally settle on a Reed or May or Romero in that role by July, when lack of said closer in April and May leads to bowing out of contention by the trade deadline? This is the lack of resolve that has infuriated the TD community. Sign Kimbrel and all will be forgiven. But does anyone think that will happen with this organization? 4. And finally, in their third hot stove offseason, this dynamic duo has completed one low level trade - Odorizzi! No, I don't count dumping veterans in July when the team is out of it. Again, if this FO was really all in to contend in 2019 they should leave no stone unturned to find at least one starter to slot ahead of a still evolving Berrios. Without a clear #1 or 2 starter, their chances to get past a first round playoff series is slim and none. Why couldn't they be proactive, package one of their stalled prospects(Sano is my choice), a top 10 prospect, and some filler to land a true ace, e.g., Thor Wheeler from the Mets, Greinke or Baumgartner. On MLB.com, one of the writers suggested a Buxton for Jon Gray trade. Very risky but when your farm system is not producing pitching, these risks must be taken in a winning organization. Instead, it is pretty clear Falvine is going to sink or swim on Sano/Buxton's 2019 performance. Oh yes, signing Josh Davidson after Sano was traded might not have been a bad Plan B. Hope I'm wrong here and we see a big rebound in 2019 but this has been such a very uninspiring offseason that I find it difficult to envision this happening unless just about everything breaks right. Do I blame the new FO for this? Not entirely. Pohlad the banker got just what he wanted - a pair that are not risk takers and who buy into the Twins way that investing money for a top free agent is not a valid approach. Tweaking the edges is good enough when all ownership wants is to make money year after year rather than invest big one or two years to produce bigger rewards in the future. Who needs Machado or Harper or Kimbrel when we can still make a profit with mediocrity. Texas didn't DFA Perez, they declined his 7.5 million dollar option. Paying him that much wasn't an option, so the fact they declined his option doesn't necessarily mean they didn't want him back. I don't think you can make a call on Yu Darvish one way or the other yet. He still has plenty of time to make the Cubs look good. It's sorta like how people immediately thought the Twins won the Jose De Leon-Brian Dozier non trade just because De Leon got hurt. We still don't know how that one's gonna turn out, but I'd rather have De Leon than Raley/Smeltzer right now. Speaking of trades, that's a thing teams do too. One thing I'll rain down praise upon this front office for is how they've beefed up the minor league system. The depth is incredible ... trade from it. Use that as your means to improve the 25-man roster if you're so put off by free agency. Do something to go for it. Now. Why are you going to wait until you're 100 games into the season? I don't like the notion that 2019 is a building year or an evaluation year. Not with the division as bad as it is. The door is wide open. At this point I could care less specifically about payroll, I just want to see this organization really invested in trying to win the division. That's not the message coming out of Target Field right now. As I've written, I can understand the desire to avoid prominent free agents. But if you wanna take the frugal route there, why not trade for a big salary, or hand out some front-loaded extensions? Alas, there's still time left for that sort of thing. Nick - do you think the Twins would pull the plug on Perez in late-April or early-May if he's struggling to the tune of a 6.00 ERA, let's say? Or is $3.5M guaranteed going to cause them to carry him deep into the season no matter what? 3.5 million is still a decent chunk of change to swallow early on. Little bit worried they'll hang on to him longer than they should to justify the signing. I think they'll push him to the bullpen if he's not effective in the rotation. In fact I wonder if they really intend to use him as a traditional "starter" at all. If he's in some sort of opener/piggybacking role, he's a little more interesting given the bullpen velo spike late last year. And then you've got plenty of flexibility in terms of managing his innings/leverage/etc. $3.5M is the going rate for an "opener"? Did Perez knowingly sign on to the Twins for such an ignominious role? His 1st time vs.2nd time stats don't even suggest he'd be successful as an opener. And the Twins don't have cheaper options in filling that role? Hit on a few of these gambles? The whole flipping team is a gamble except for Rosario, Berrios and maybe Gibson. We are always betting on long shots and maybe a couple of middle shots. They can't even seem to get the sure things right (Buxton and Sano). When we do get a decent pay back they let them go (Escobar, E Santana and Hicks).I am 99% sure we are going to regret letting Santana go. So this year as in the last 10 or so we have to hope most of our players can find one more year when they are 2 years removed from their last good one. On the positive side I am glad Escobar, Santana, Hicks and Dozier are on to bigger and better things! Hit on a few of these gambles? The whole flipping team is a gamble except for Rosario, Berrios and maybe Gibson. We are always betting on long shots and maybe a couple of middle shots. They can't even seem to get the sure things right (Buxton and Sano). When we do get a decent pay back they let them go (Escobar, E Santana and Hicks). I am 99% sure we are going to regret letting Santana go. So this year as in the last 10 or so we have to hope most of our players can find one more year when they are 2 years removed from their last good one. On the positive side I am glad Escobar, Santana, Hicks and Dozier are on to bigger and better things! The Twins have a budget, whether we think they should or not. Bringing back Santana for $14 million was not a realistic option. What bigger and better things is he on to? Last I checked, he's still without a team. He suffered an injury that he'll likely never be the same from, we're you watching the same Santana as I was last year? The oddest part is within the context of your post, as Santana would have been the biggest gamble of them all. To be honest... the one thing you don't really question is by far the most concerning concern I have. This team went down with the ship last year. It's important to be efficient, but who cares if you are the team that spends the least to win 80 games?I am really underwhelmed so far, and barring a significant trade I don't see how this team is going to take the next step, other than our traditional two-tiered strategy of Wait & Hope. Career ERA first time through order 4.13. Careersecond time 4.17. If you were going by the small sample size of lust his last year's statistics ast year then his 2.45 ERA as a relieverwould say that he could be a very effective pitcher. Who cares if you are the most expensive team to win 73 games? Thank you, Nick, for a rational review of what is happening this winter.Was a pleasure to read it. I think this team is still in a wait and see mode on the younger players, fill in a few holes -- they needed asecond basemen -- see if Buxton and Sano are going to produce, also Kepler and Polanco, that gets them a year closer to Lewis and other young players that THEY drafted, then decide to make a big splash after we see how all the young players develop. The optimistic (and I think more realistic) view is that they're treading water until June or July. I agree with the opinion that the Twins are looking to see how their young players, mainly Sano and Buxton, and to a lesser degree Berrios, Kepler, May and Romero and the pen, perform and then decide what they are going to do come June and July.If these guys play at their potential (and they have done it before in varying degrees and for a varying length of time) the Twins could be close to or even ahead of a weakened Cleveland team by mid-season. And this is not a bad strategy by any means, because no matter what (even if they signed Machado and Harper and Kimbrel and Keuchel), if the young core is not playing up to its potential, the Twins would not be a competitive team in the postseason, and might not even make it to there. Many complain that the front office isn't doing anything to put a winner on the field in 2019.I'm fine with it.They don't really know what they have in Buxton and Sano, so they are biding there time.And besides, don't dismiss doing nothing. Most damage in sports, in business, in life is caused by doing too much.I think doing nothing is generally underrated!